News organizations have been reporting in recent weeks that Twitter’s growth rate has been slowing, which has spurred speculation about its future. The Pew Research Center has watched social networking in the U.S. grow faster and change more than most other internet activities, and that landscape continues to evolve quickly. Our studies have shown that Twitter occupies an important segment of the social networking world, but, in sheer numbers, its user base lags far behind the social networking behemoth Facebook. 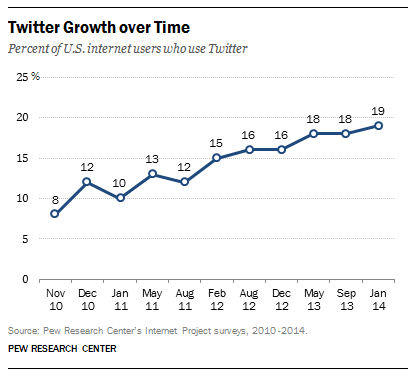 When Pew Research first began tracking Twitter usage in November 2010, 8% of online adults used the platform. As of January 2014, 19% of online adults were using Twitter. The last time we asked about Facebook in September 2013, we found 71% of internet users using the social network. But judging whether Twitter can survive in a Facebook-dominated world might not be the right predictor of its staying power in the market because of the niche it occupies. Put simply: Twitter is different; not only in who it attracts, but also in how it is used and how messages spread on the platform. Twitter also often acts more like a broadcasting network than a social network, connecting speakers and their content to the public. This partly stems from Twitter’s social architecture. On Twitter, anyone can follow anyone else on Twitter without there being a reciprocal agreement between the follower and followed, as there is on Facebook. Thus, the structure of Twitter is a more public one when it comes to activity by its users—something that might limit the total number of people who would want to use it. Not everyone has things they want to say to a crowd. One way Twitter sets itself apart from Facebook is its use as a news platform. Our research has found that passing along information about breaking news is a core function of Twitter. Nearly one-in-ten U.S. adults (8%) get news through Twitter, and roughly half of Twitter’s own users get news on the platform. Twitter users as a group seem especially tuned into news, media, culture and civic life. Further, Twitter is also a greater source for news than Facebook when it comes to mobile devices. The majority of Twitter news consumers (85%) get news (of any kind) at least sometimes on mobile devices, which exceeds Facebook news consumers by 20 percentage points (64% of Facebook news consumers use mobile devices for news). Twitter has also evolved into a unique ecosystem when it comes to the way people form groups for a variety of purposes. A special analysis of tens of thousands of Twitter conversations by the Pew Research Center and the Social Media Research Foundation found distinct patterns to the conversational and social structures that take place on Twitter, all with different purposes. These include “polarized crowds” that form around political topics; crowds that gather around areas of learning; clusters that form around brands and celebrities; “community” groups that arise around conversations about aspects of global news; breaking news; and support networks (such as those set up by businesses for their customers). The Twitter conversations study shows that Twitter can be essential for these specific kinds of conversations, especially those where news and politics are central to the conversation, and those that form around commentary from pundits that are potent agenda setters and conversation starters. If Twitter has its limits, why does it get so much attention? First, it is used by a lot of people, even if it’s not in Facebook territory. Second, Twitter is technically set up in ways that make it relatively easy to measure and study. Third, the things that interest Twitter users are the things that interest journalists and scholars. The Twitterverse is made up largely of political activists and cultural commentators. It may be that the American Twitter user base never approaches social media giants like Facebook. And it may be that other platforms like LinkedIn, Google Plus, Pinterest and others still being hatched in garages find ways to appeal to broad niches of users that limit the ways Twitter can expand. Still, it is also the case that as long as political influencers and activists consider Twitter to be an effective platform, it will be an important cultural barometer.